For Democrats, Donald Trump was supposed to be the dream opponent. Reckless and proudly un-PC, Trump offended so many major voting demographics in the United States that it seemed the Democrats' path to the White House would be a cakewalk. And yet, the most recent polls suggest far from a runaway victory. A CNN/ORC poll published Tuesday actually shows Trump with a two point lead over Clinton. While Clinton was rising through August, enjoying more than a post-convention bump, her campaign is now facing the music. It appeared to be hoping to give Trump enough rope to hang himself. Instead, Clinton has lost control of the election narrative — and it could hurt her big time. 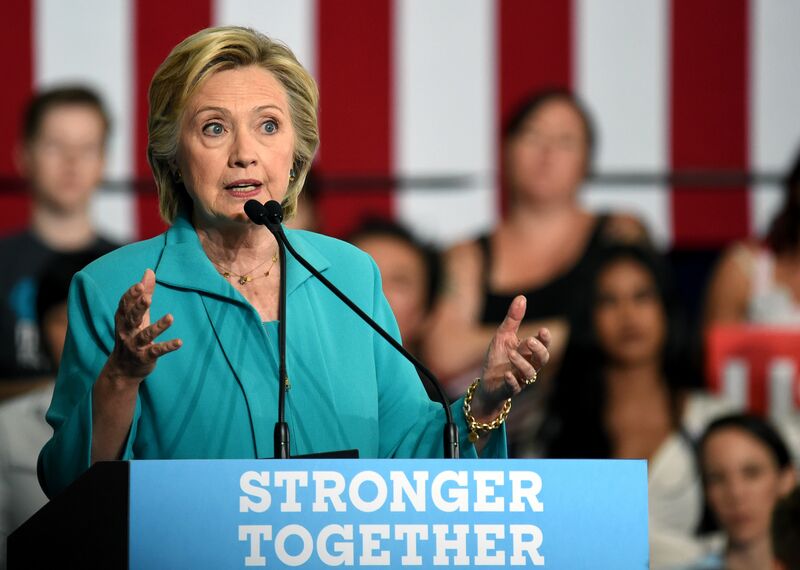 Let's take a look at what have become the major issues of the campaign in the past week: Clinton's email server; the Clinton Foundation's donors; even, whether it's suspect that Clinton sometimes coughs while giving long speeches on the campaign trail. During the first presidential debate — scheduled for Monday, September 26 — it is certainly possible that valuable time will be devoted to asking Clinton to speak about these controversies. This is time that could be devoted to talking about Clinton's preferred issues, such as the preservation and promotion of LGBT rights, her detailed plan to improve mental healthcare, or women's health and reproductive rights. What I see is a pattern: the problems that plagued Clinton's primary may plague the final months of her race to the White House. Clinton won a much narrower-than-expected victory in the Democratic primary against Vermont Sen. Bernie Sanders. In the early days of the campaign, Clinton and her crew didn't seem to take him as a serious threat and, perhaps as a result, they didn't forcefully attack him. Instead, Sanders took control of the narrative, painting Clinton as Wall Street's dream president and the embodiment of the status quo. Clinton ultimately won the Democratic nomination — and by a not insignificant 3.77 million votes and more than 300 delegates (non-super)— but Sanders' attacks have more than lingered. In fact, Trump's campaign has recently quoted Sanders' comments about the Clinton Foundation to attack the Democratic nominee. As we enter the final months of the presidential election, I see that once again, by not taking the knocks against her seriously, Clinton has lost total control of the narrative this campaign cycle. Instead of seeming above the fray, Clinton seems afraid of it by failing to promote her own, concise explanation in the face of the controversies that surround her. It's no secret that the Clinton campaign has plenty of ammunition to use against Trump — the Trump University lawsuit, his attack on a Gold Star family, the fact that 50 senior Republican officials authored an open letter saying Trump would put the country's security as "risk." And she and her surrogates take aim and fire, but they don't do enough to explain Clinton's own controversies to voters. If Clinton and her supporters are serious about keeping a Democrat in the White House come 2017, they must stop "running out the clock" and start engaging voters by scrutinizing Trump and by providing clearer, more consistent answers to persistent questions about Clinton's emails and the Foundation. Ultimately, if Clinton continues to try to trick Trump into hanging himself, she's the one who will wind up being on the ropes.